I love wearing cute and flirty romper during the spring and they are perfect for the transition to a sweltering summer. These sweet one pieces can be worn so many ways. I love to wear mine with long cardigans and high socks or like here with a cute blazer. However, if I had to run to a more formal event I could easily throw on a pair of trousers and a cropped jacket and turn it into a top! My Steve Madden clogs are my new favorite item, they were definitely worth the wait. I also had to share with you my Breakfast at Tiffany eye mask. I love slipping it on and feeling oh so Holy Golightly. She truly embodied a glamorous and confident attitude when no one was watching. PS: You can join my giveaway! that blazer and ur sandals are so cute! LOVE the shoes!! Such a cute outfit! 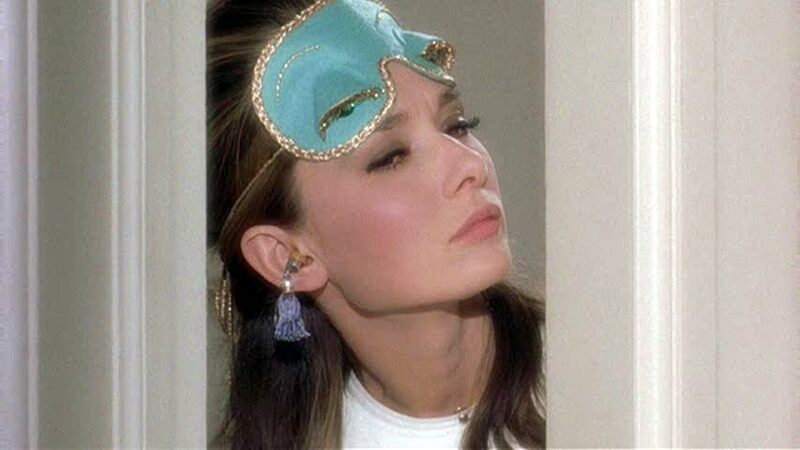 Where, oh, where did you find that Holly Golightly mask? Cute! Love that you paired it with a blazer--very chic! You look fantastic in the pictures! And I adore your sandals with the socks! Daaaang girl! You are so fabulous! Love this outfit. I think it's absolutely impossible for you not to look stunning! Need those shoes! Oh my! You are too cute! LOVE this outfit! You look great! I love the socks with sandals look (as long as they're not flip flops, haha). Animal print ain't easy to wear, but you've styled it perfectly! Love it! I love the romper! So cute! amazing shoes, i would love to have steve madden in Italy! love the sock touch too. I love those shoes. And I like that you paired such a breezy, light colored cardigan with that jumper. You look so great! i still need to get my hands on a romper that suits me well.. :D that leopard one is stunning!!!! plus, with the pink blazer, it's so lovely! You look amazing. Powder pink and leopard print is such an unexpected combination, but it works so darn well! Love this sooo much! LOVE the clogs -- i want them, but i just bought a pair! is that so ridiculous to get another?! so cute. I love it! light pink looks really great on you! Love the mask. I have the book and the movie. Cute romper and those shoes are perfection. love the shoes, but i like them sans socks! You look adorable ...those shoes look like my new Miu Miu's...but why the socks? You have such amazing legs. love your outfit, and this shoes are so hottt!!!!!!!!! OMG may I please have this outfit?? U look Amazing!! You styled those fabulous shoes soo well! You look fantastic! Omg you look so stunning, love this pictures. You look amazing as usual! love those shoes. It's a shame you couldn't be there, but I absolutely understand that it's a hassle to drive all the way to the city on a work night. Rompers are the way to go! But it's so hard to get in and out of this print romper that I got from Haight... sad, but I still love it! Those Steve Madden clogs are super cute. I want a pair of clogs too, maybe I'll find a pair when I go home! Those clogs are to die for. I am never disappointed when I click on your blog. You are always dressed to beautifully. You are definitely one of my favorites. So pretty! I love the playsuit and your shoes! Love this look!! I totally rocked socks with my heels today too. You have amazing style. So glad I found your blog! Adorable jumper! I actually just got the exact same one put in polka dots last weekend :) you look beautiful darling! wow!! great look. love the short leopard print mixed with the classy blazer. and the ankle socks are jus the cherry on top of an amazing pair of shoes. i love that you shot these on a tennis court! Love this outfit.The white sock are adorable on you.Did you get a lot of good comments from people who saw you in this? Those shoes are fantastic. I love the coloring! H&M made a leopard dress in that print too. I didn't know they made a romper like that. It's so cute. I just purchased my first romper today...so we'll see how that goes! I hope it's as amazing as it looked on the website. Your shoes are crazy! You pull them off so well in this outfit. Gorgeous! wow you wore this outfit so beautifully! not anyone can pull this off. Lovely outfit, I like it!! At first sight I though these heels were from Miu Miu, I saw almost the same pair but in beige color. Really love them! They're the summer perfect shoes! You always look so amazing, babe! perfect! love the shoes... you look amazing! Hi! I stumbled across your blog and I must say, LOVE your style and your photos!! That romper looks so great on you. You really can never go wrong with leopard, in my book. Also, really loving the steve maddens! amazing. the jumper works so well on you. Gooooogreous jumper!! You look so cute in your bad!! Great pictures.